Electrical problems aren't always easy to detect, and usually aren't a DIY project. Here are 8 signs you have electrical problems that require a professional. A National Fire Protection Association report showed that between 2010 and 2014, fires that involved electrical problems caused an average of 420 deaths per year. They also cause 1,370 injuries and an amazing $1.4 billion in damage to properties. Getting electrical problems fixed now could be a life or death decision. Electrical problems are not necessarily the kind of problems you can simply Google, watch a YouTube video on and resolve. Professional electricians have extensive training and qualifications to protect you from the potential dangers of electricity. How do you know when you have an electrical problem? What are the telltale signs to look out for? When should you make that call? Read on for 8 signs you have electrical problems that require professional help. Electrical circuit breakers are designed to trip if there is a problem. Likewise, fuses are designed to blow if there is a problem. The reason the circuit breaker is tripping or the fuse is blowing is the circuit is drawing more current than it ought to. If you are experiencing either of these issues very occasionally there may not be a problem. It could be an isolated power surge. If it is happening more than very occasionally, it may suggest that you have a problem that needs investigating by a professional electrician. If you have a disruption to your main power supply you may experience a flickering light. If your neighbors are also experiencing this problem then it may simply be a local, temporary power supply issue. No need to call in an electrician. If your lights dim or flicker from time to time, and there is no neighborhood electrical supply problem, you may have an appliance that is drawing too much current. The overloaded electrical circuit is not suitable for the appliances. 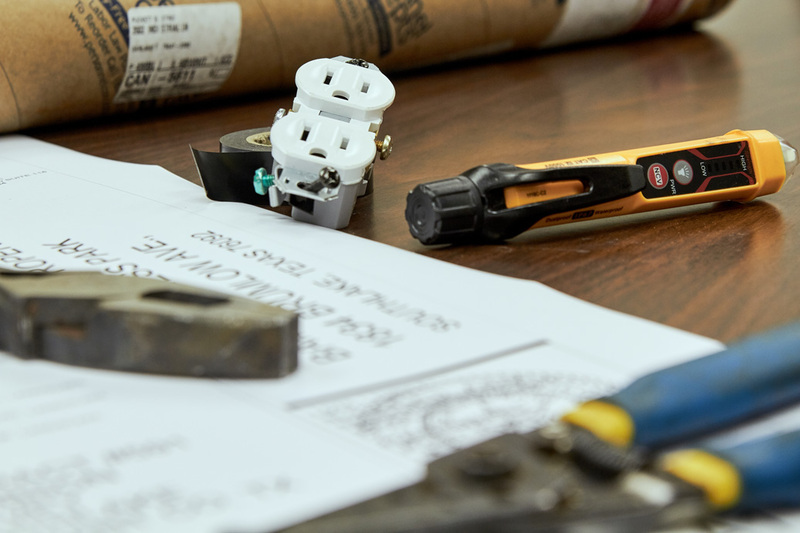 Call an electrician who can detect the source of the problem and resolve it. If you do not have sufficient power sockets for your appliances you may have resorted to using multi-sockets. This increases your options to plug in additional appliances. It may also mean you are putting a strain on the socket, circuit or the whole system. The occasional multi-socket for low powered appliances may be fine. Higher powered appliances and multiple appliances may benefit from their own dedicated supply. Contact a professional electrician who can install additional sockets where you need them. Like the problem of too few sockets, not having sockets in the right place can lead to unsafe practices. Using an electrical extension cable can be a useful temporary solution but take care. When they are used to resolve a problem more permanently, there are risks. It is tempting to overload a circuit when using an extension cable. Sometimes people use a multi-socket on both ends of the extension cable without being aware of the total impact on the socket. This can lead to serious problems. Trailing cables are at risk of damage, exposing live wires. They are also a trip hazard which can result in injury and damage to appliances and furniture. Call an electrician who can fit a convenient power socket where you need it. If you have an older home, you may have old power sockets. Old power sockets may not have sufficient safety features. Any rusting may also indicate a problem with exposure to damp or water. Cloth covered wires, wear and tear on fittings and aged light fittings could all be worth checking. If you have any doubts about the age of your electrical power sockets or any part of your home electrical wiring get it checked by a professional electrician. A simple test to do for yourself is to turn lights on and feel if light switches warm up. You can also do this with sockets and other electrical components. Use the socket for a while and simply feel if the outer surface is warming up. This could indicate electrical problems. Any discoloration on switches, sockets, plugs or other electrical components is also a warning sign. A smell of burning or melting plastic is also not normal. Call an electrician. If you receive any electrical shocks it's time to call in the professionals. Even a mild electrical shock is an indication of electrical problems. There is no acceptable level of electrical shock you should get from your electricity supply. A professional electrician will be able to diagnose the cause and resolve the problem. If your kitchen or your bathroom are not in great condition, you may also have electrical problems in these rooms. These locations in your home are especially hazardous because of the possibility of mixing water and electricity. In wet areas, electrical wiring and appliances need to be properly protected from contact with water. Even condensation or splashes can be hazardous. If the electrical supply is not sufficiently insulated there is a risk of short circuits, electrical shocks, and other damage. If you have any doubt, get an electrician to check that everything is safe in your kitchen and bathroom. If you have any of the problems described here you should have a professional electrician check your home for electrical problems. Select an experienced electrical contractor with a reputation for excellent service. Ask around for recommendations and check customer reviews. Ask electrical contractors for details of their qualifications and licenses. A professional will be pleased to provide this information. You will have the peace of mind that the work they do will be done right. To talk to the professionals about electrical problems, click here.